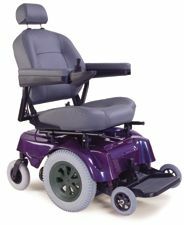 The most advanced power chair available today! At first glance, the Jazzy Select 14 catches your eye with it's sleek styling and sporty edge. Yet the Select 14 is so much more! The Select 14 delivers the advantages of the patented mid wheel drive for manuvering in tight, compact spaces. Loaded with performance and convenience features, like a powerful 50 amp, PG VSI controller, large batteries for a 30% greater per charge range, a 300 lb. weight capacity and an on-board battery charger, the Jazzy Select 14 is as easy to use as it is to enjoy. An optional upgraded XL package offers 350 lb. 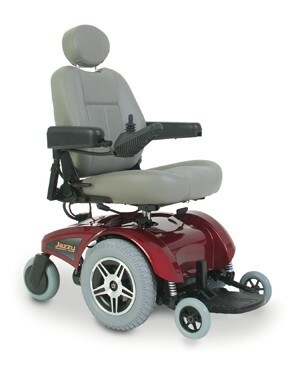 weight capacity, contoured seating up to 22" wide and Solid 14" tires. Available in all Candy apple red, viper blue. 50 amp PG VSI controller. On-board , 4 amp charger. Powerful, patented two-motor mid-wheel drive design provides superb power and acceleration.. Height and width adjustable flip-up armrests. 14" drive wheels and optimum weight distribution offer superior traction. Large 22 nf batteries for maximum range. Drive Train 2-motor mid-wheel drive.